As per ACMA, counterfeit auto parts are directly or indirectly responsible for up to 20% of road accidents. This means many deaths and serious injuries can be avoided if all the fake auto parts could be eliminated. Counterfeiters these days have become so smart that fake products look and feel exactly the same as genuine ones. But the fake products are generally made of substandard materials and certainly don’t go through the quality checks. To spread the awareness about the adverse effects of the counterfeit auto parts, BMW recently posted a video on the comparison of fake and genuine parts. The video shows the performance difference between original and counterfeit brake pads. In the video, BMW car at the speed of 100 km/hour comes to a complete halt between 37-38 meters with the original brake pads, while the car at the same speed comes to complete stop between 55-62 meters when the brake pads are fake. The difference is huge and could lead the driver as well as the co-passengers into severe and many times fatal accidents. Other counterfeit auto parts too would be equally dangerous. Are counterfeit auto parts really cheaper? One can buy fake auto parts lower prices than the genuine ones, but they are not cheap, as they may endanger a person’s life. 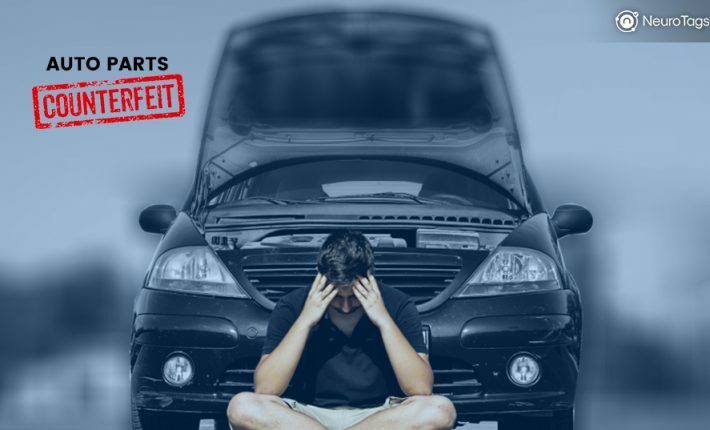 Many unsuspecting customers fall prey to counterfeit auto parts. These parts affect the performance of the vehicle and may also damage it. Customers start losing trust in the brand, thinking that the brand’s auto parts are of low quality. So the brand loses revenue and customer trust because of the counterfeits. Automobile servicing workshops also lose business in the long run, if they knowingly or unknowingly install fake parts while fixing the customers’ vehicles. And the vehicle breaks down just in a few days or the vehicle performance degrades after the serving. The customers start to feel that there is something wrong with the servicing workshop. They stop going to that workshop after repetitive bad experiences. Counterfeiting can be prevented if people stop buying fake auto parts, and the people will stop buying these phony parts if they know how risky such parts are and have a way to identify the genuine products. So to prevent the counterfeiting, the Auto parts manufacturers need to provide a method for its customers to identify the original products. In a nutshell, counterfeiting in auto parts is a severe problem, and we need to do something to end it. With the help of NeuroTags Anti-Counterfeit solution, brands can provide a way for its customers to uniquely identify its genuine auto parts. NeuroTags offers a tightly coupled pair of tags. One tag couple forms a crypto tag, and each crypto tag consists of an open tag and a protected tag. Open and protected tags are algorithmically linked with each other. These tags are to be applied to the products to protect them from counterfeiting. The protected part of the crypto tag can either be hidden under a scratchable layer or kept inside the sealed pack. The buyers can scan the open tag to verify the product authenticity with a fair amount of certainty before making the purchase. They have access to the protected tag only after buying the product. By scanning the protected tag, the buyers can be 100% sure that their product is genuine. Vehicle owners generally don’t change the auto parts themselves; they go to the mechanic they trust. And most of the times buy the parts suggested by the mechanic. Auto parts manufacturers can motivate the mechanics to buy genuine parts by running a loyalty program for the mechanics. The manufacturers can use NeuroTags Loyalty program feature to run the loyalty programs. 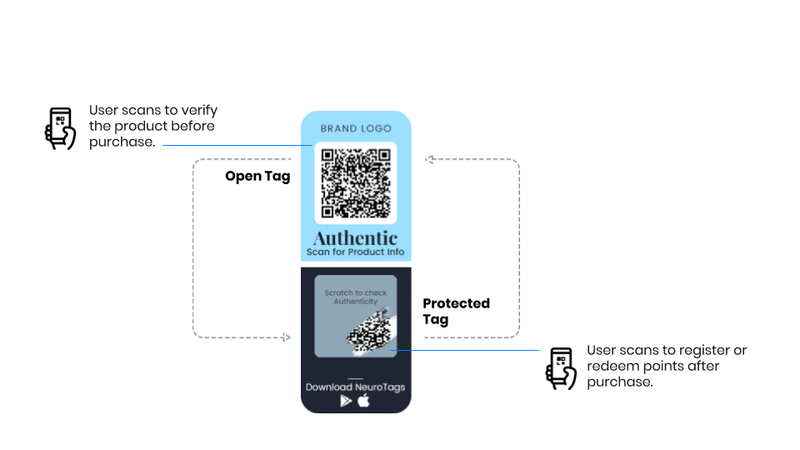 NeuroTags offers loyalty programs feature on the same tags that are used for preventing the counterfeits. A detailed description of NeuroTags offerings specific to the Auto Parts industry can found at Anti-Counterfeit Solution for Auto Parts page.